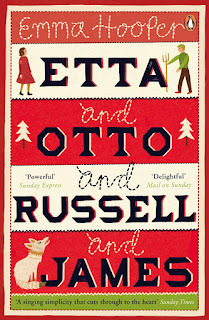 Thanks to Penguin Ireland for inviting me on the blog tour for Etta and Otto and Russell and James. Coincidentally, this is my current read and, even more amazingly, I am going to meet the author today at the RTEGuide/Penguin writers workshop in Dublin. To be in with a chance of winning a paperback edition of this beautiful book, just enter via the rafflecopter link below. Good Luck! This is a love story that spans fifty years, three lives, two continents and an ocean. It tells of school teacher Etta, who settles in the Canadian prairies during the Great Depression and of the two pupils who fall in love with her: Russell, a city boy who takes to farming despite his twisted leg, and Otto, who struggles in school but always tries hard - even when he's sent to fight a war in a distant land. It is a story of love and joy, pain and passion, memory and forgetting - and one incredible journey. It is the story of Etta and Otto and Russell and James. Her grandparents. I would love to read this book!